ADA, Minn. (June 7, 2018) – A big crowd of race fans packed Norman County Raceway’s Family Night, presented by Titan Machinery, on Thursday. Next week is Dollar Hot Dog Night at the races. Jamie Trautner of Hendrum picked up the Sanders Metal Products IMCA Modified feature win after a great battle with Tyler Hall. Hall led the field in the early going as Trautner filed into second ahead of Rob VanMil. Trautner peaked to the inside of Hall on lap three and pulled even with him down the back straightaway. 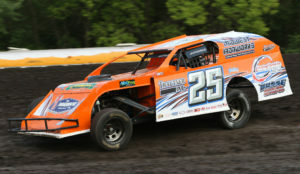 Photo: Jamie Trautner picked up a thrilling IMCA Modified feature win Thursday at Norman County Raceway in Ada. The lead duo traded the top spot for the next three laps before Trautner prevailed to take the point. Hall remained within striking distance of Trautner for the next several laps. At the halfway point, Hall made one more charge on Trautner as they swapped lanes around the high-banked three-eighths-mile dirt oval. Trautner eventually stretched out his advantage in the late stages of the race. Trautner went on to claim his first Norman County Raceway win since June 22, 2017. The Titan Machinery IMCA SportMods had the wildest race of the evening. Brandon Tendeland led the opening laps until Luke Johnson claimed the lead on lap five. Aaron Wetterlin followed Johnson into second. A restart with six laps to go made for one of the best battles for the lead seen all season at Norman County Raceway. Wetterlin took the lead with five laps to go, but Johnson came back with a big slide job in turn three to reclaim the spot. Wetterlin drove around Johnson in turns one and two before Johnson executed another textbook slide job on Wetterlin at the same end of the speedway. Johnson held on to the lead with two laps to go until he spun out on his own in turn three and collected Wetterlin. Johnson was called for the caution as Wetterlin inherited the lead for the restart. Wetterlin went on to take the win as Kelly Jacobson edged out Andy Wagner for third. Wagner, who is the current point leader, rebounded for a podium finish after clipping an infield tire barrier earlier in the race. Rick Schulz, who barrel-rolled his IMCA Stock Car, last Friday at Red River Valley Speedway, jumped out to the lead of the Norman County Implement feature. Schulz held the lead until Rob VanMil tracked him down and took the point with six laps to go. Once out front, VanMil opened up a big lead and earned the win. Tim Shiek picked up the Christian Brothers Ford IMCA Hobby Stock feature win. The win was his fifth in the last seven races overall. After picking up his first career Christian Motors WISSOTA Midwest Modified win at Norman County Raceway last week, Lance Schill of Langdon, N.D. went back-to-back. Schill moved into second in the early going from his third starting position. With 11 laps to go, Schill had reeled in Jeff Nelson for the lead. Schill searched for a way around Nelson for two circuits until he found enough momentum on the high side of turn two to take the lead down the back straightaway. A late race restart set up a green-white-checkered finish. Fifth place starter, Justin Froemming, drove his car deep into turn one as the race resumed and pulled even with Schill, but Schill was able to power back by before cruising to the win. Weekly Thursday Night Thunder classes will be in action next week, plus the NLSA Lightning Sprints. Green flag drops at 7 pm. © 2019 Norman County Raceway.